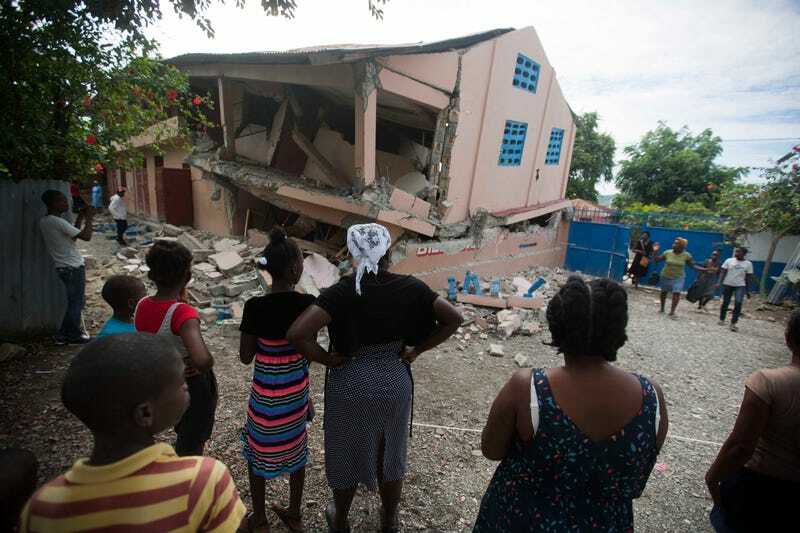 Residents stand looking at a collapsed school damaged bya magnitude 5.9 earthquake the night before, in Gros Morne, Haiti, Sunday, Oct. 7, 2018. Emergency teams worked to provide relief in Haiti on Sunday after the quake killed at least 11 people and left dozens injured. At least 12 people are dead and more than 100 people are injured after a 5.9 magnitude earthquake hit the northwest region of the island nation Sunday. The Miami Herald reports that Haiti officials expect the death toll to rise and disaster relief teams have been dispatched to affected areas. The earthquake occurred about 12 miles north of Port-de-Paix in northwest Haiti. In addition to the injuries, dozens of homes and private buildings were damaged or destroyed in the northern region of Haiti. Government structures, other than a cultural center in Gros Morne that collapsed, were generally undamaged. “Search and rescue, and assessment still ongoing,” Jerry Chandler, the head of the country’s Civil Protection disaster response unit, told the Miami Herald. Port-de-Paix, a port city with a population of over 462,000 inhabitants, has experienced some local political challenges that are complicated recovery efforts. The principal mayor, Josué Alusma, is in hiding, according to The Herald. He was accused of orchestrating the death of one of two assistant mayors this year. Consequently, residents and public employees were pretty much on their own in the wake of the quake. In 2010, Haiti experienced a magnitude-7.0 earthquake that claimed more than 250,000 lives from which it has never fully recovered.